If you are thinking of making a Yorkshire Terrier puppy apart of your family and you have young children, it is imperative that you make sure your children are actively involved in the dog’s life and know how to properly handle the dog. Is a puppy the ideal choice? You’ve decided that a Yorkie is the dog breed you want, but have you considered if a puppy or dog would be a better choice? Remember, a puppy is a huge responsibility that takes plenty of time to train. Furthermore, if you have a new born baby, or children under a year old, puppies are not recommended as a puppy needs your undivided attention. When you adopt a dog his personality will already be developed, so you don’t have to worry about him changing. That being said, Yorkshire Terrier puppies can be a lot of fun, especially for young children or teens who want to play with a dog that has as much energy as they do. Is a Yorkie the right size for your family? 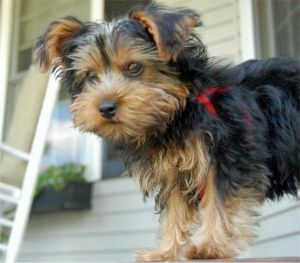 A Yorkie is one of the smallest dog breeds in the world. A full grown Yorkshire Terrier weighs between 5-7 pounds. This means that your dog can be easily injured if he isn’t gently handled, is stepped on, sat on, etc. Therefore it is vital that you teach your children how to properly handle and play with the dog. You need to make your child extremely aware of the fragility of the dog. Due to the fact that most children won’t understand how fragile the dog is, and because they sometimes don’t know their own strength, many breeders recommend that Yorkshire Terrier puppies shouldn’t be placed in a family with children under the age of 7. Supervise your children – If you have children under the age of 6, you should supervise your child when they are interacting with the dog. Just like a Yorkshire Terrier puppy, young children are incredibly inquisitive and impulsive. A young child won’t think twice about making sudden movements towards a dog, poking him or grabbing him; and a dog won’t think twice about snapping at a child if he feels threatened by their behavior. Thus, you need to teach a child that it is unacceptable to tease, frighten, hurt or challenge the dog. Teach your child how to properly socialize with their family pet. The more your child understands the dog, the quicker they will learn to treat it with the respect and care the dog requires. 3 – 5 years of age – Hang the dog’s leash. 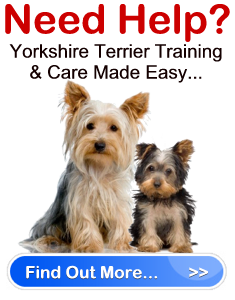 5 – 7 years of age – Measure the food the Yorkshire Terrier puppy needs and put it in his food dish. Fill his water dish. 7 – 10 years of age – Feed the dog, clean up after the dog, take him on a supervised walk. 10-12 years of age – Help train the dog, pick up after the dog, take a trained dog for a walk, help an adult with grooming. 12 and up – Groom the dog and do all other chores. Finally, all ages can take part in one of the most important dog chores of all – playtime. A Yorkshire Terrier needs plenty of love and attention from everyone. There is no harm in having children and owning a Yorkshire Terrier puppy, as long as you are prepared to teach children everything they need to know, and make sure they stick by these rules. Never forget that you are primary caretaker of the dog. The Yorkie is your responsibility. It’s your job to ensure he remains safe, healthy and content.